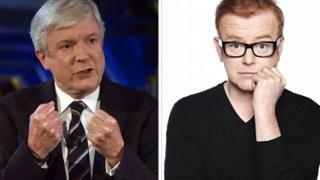 BBC director general Tony Hall has said the publication of star salaries was a factor in radio presenters Chris Evans and Eddie Mair choosing to leave. Lord Hall told a committee of MPs the pay disclosures had "made it harder for us to retain people like that". Evans is moving from Radio 2 to Virgin, while Mair has joined LBC from Radio 4. "We have to recognise we're not going to attract people at the kind of mega sums others in the commercial sphere might be able to pay," Lord Hall said. The director general said Evans found the pressure "quite hard" after topping the BBC talent pay list last year and coming second in this year's list. "For three or four days he was the centre of a lot of attention," he said. Lord Hall told the House of Commons Digital, Culture, Media and Sport select committee: "[It has a] bearing on when you think about where you want to work in the future. I think he's a remarkable presenter. He's a loss to the BBC, a loss to our audiences." Who will take over from Chris Evans? Who earned what at the BBC in 2017-18? However, Lord Hall also said: "I have no complaint, disclosure is a good thing." He added that Evans, who was paid £1.66m in 2017-18, also wanted to leave so he could find a new challenge. Last year was the first time the pay of stars earning more than £150,000 had been made public. The BBC was compelled to reveal the information under the terms of its new royal charter. Lord Hall said the corporation would "find the next generation of talent" and promote from within rather than compete with the "mega" salaries on offer from commercial rivals. "A lot of [current BBC] presenters I know could make possibly more money outside but actually are not doing it for that - they're doing it because they're committed to the BBC and I admire them hugely for that," he said. "But of course we will lose some people and of course we have lost a couple of people for a large number of reasons, but no doubt disclosure and the fact people know their pay has been a factor in some of those losses." Lord Hall was asked about equal pay at the corporation, given that the top 12 earners on the BBC's latest list of star salaries are all men. "Myself and the team want to get to the point where the top 20 are made up equally of men and women and not just women at the bottom and men at the top," he said. The director general also revealed he had approached Sir Cliff Richard personally ahead of the recent court case involving the BBC. In July, Sir Cliff won his privacy case against the corporation over its coverage of a 2014 police raid on his home. The singer said the BBC's reporting of the raid, which included helicopter footage of his home being searched, was a "serious invasion" of privacy. He was never arrested or charged. Lord Hall said: "We approached Sir Cliff's lawyers and... I approached Sir Cliff on a couple of occasions suggesting could we sit down and try to sort this out without going to the court. "But sadly, and, I guess understandably, the legal view came back that, 'We don't want to talk.'" Lord Hall added that Sir Cliff's team said they were only prepared to reach a settlement if the BBC admitted it had acted illegally, but he said he didn't think the corporation had acted illegally. He said: "We are really sorry about what Sir Cliff has been through. "We reported accurately what happened but we overdid it, the helicopter overdid it, it was something to report but [further] down the bulletin." Lord Hall also said the BBC would be publishing a new edition of its editorial guidelines later this autumn, following the Sir Cliff episode. The committee also discussed the BBC licence fee concession for over-75s. The government used to meet this cost in its entirety but it was agreed in 2015 that the BBC would take on the full cost of the concession over a phased period. The BBC is due to absorb the full cost from 2020/21 - but Lord Hall said the corporation will review whether it continues to offer the arrangement after that time. Lord Hall said it was "a difficult balance between what people can afford and our need to give proper services". He added: "[It's]quite a weighty decision. A very difficult issue." The total financial liability for licences for over-75s for 2017/18 was £655m.